The sight of a coach on the sidelines with notepad and pen may be numbered. In the modern day with gadgets galore and the ability to do pretty much everything except make the half time cuppa on an iPhone, there is an increasing demand to be able to use a device to devise, build and share your training sessions or tactics. At EachGameAsItComes.com we are no different, so have picked out ten smartphone and/or tablet apps and/or software applications for soccer coaches. Please note prices were correct as per the time of writing but are subject to change. For: Designing and sharing training sessions and tactics. Details: 24/7 coach is a fairly straightforward and basic session planning app for the iPad. 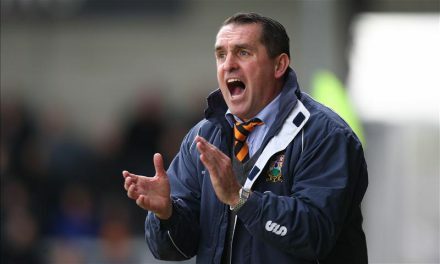 The coach gets a choice of pitches, including Futsal, on which to build the session and can then add players and equipment along with directions and notes. The session is then saved as an image file which can be shared via email or social media. It perhaps lacks some of the features of some of the other apps and software – perhaps the for sessions with multiple progressions and the ability to save as a PDF. A recent drop in price has made 24/7 coach a more realistic proposition for coaches looking for a simple app. 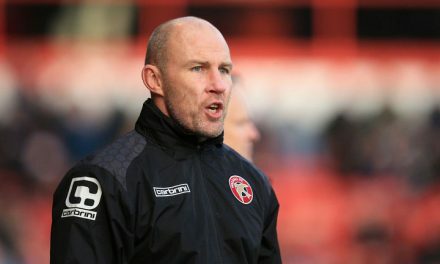 Details: A partner of the English FA, TactX enables the coach to bring to life their session plans and demonstrate to the players how a session should work. 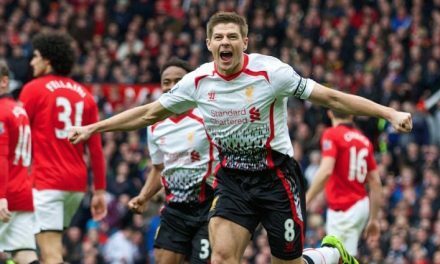 Players are customisable and the graphics are realistic, as the designers created the animations using real life footballers in action. The created videos can then be exported for presentations and mobile devices. The video exporter is available for an additional £60.00 per year or £100.00 if purchased with the animator software. 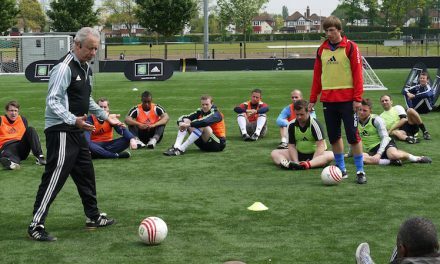 Members of the FA Licenced Coaches Club are offered discounts to the software. Details: A development of the original iDrills software (who also produce iPad apps for Rugby and Multisports/PE), produced in conjunction with the English FA, the FA Coach’s App is an easy to use session planner with a library function to store all the session plans and progressions, as well as an innovative system that allows not only the ability to share via email or social media, but two other functions known as CoachMates (a private and secure content sharing platform) and TransferMarket (sharing worldwide and download other practices, costing from a monthly fee of £1.99 to a yearly fee of £18.99). Members of the FA Licenced Coaches Club get access to exclusive content and also an unlimited number of CoachMates (usually 99p). Details: Tactical Pad Pro is available for multiple platform and enables the coach to create tactical diagrams using a saved squad list then display them in standard or 3D diagrams which can then be saved in a library. Those with the Windows application, can also upgrade the software to add video analysis amongst other premium features. On the iPad the app is straightforward and quick to use, and we’ve also found the creator to be very responsive to suggestions. For those looking for a free version, Tactical Pad Lite is also available which only allows limited saved plans. For: Creating and sharing training sessions and tactics. Details: A fairly recent addition to the market with certain elements of both the software and the accompanying website still being completed, Tactica Soccer is a straightforward yet clever app for designing coaching sessions and then sharing in 3D animation. 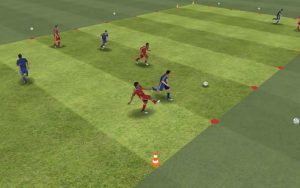 Players can personalised to represent the individuals in your squad, and drills can be saved and shared. Soon to come are sessions animated from a players view, and the ability to upload and buy drills. Details: Developed in Poland and available in multiple languages, Coach Tactical Board for Football (Soccer) allows the coach to create drills, tactics and team selections, customise the players, save in structured fashion within the app and share via PDF or image files. There is a reduced functionality free version also available, although as it’s only a few pounds/dollars, it’s probably worth just getting the full version straight away. Not as advanced as others listed here, but decent enough to leave that chalk board redundant. Details: At the more Premium end of the market is the feature packed Mourinho Tactical Board, which is available in the standard format or a special NSCAA version, available on multiple formats and with six languages built in. 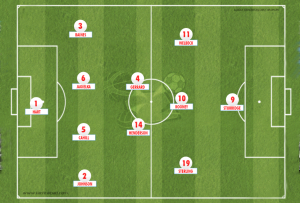 The app has been specially designed to be lightweight on the device so as not to affect performance, and is aimed at coaches and scouts looking to design and share tactics and plays, which can then be animated. Also available is a Pro Version (£44.99/$59.99) which has greater sharing options, a notepad, and the capacity to store statistics for each match. The Mourinho Tactical Board range is, much like the coach its named after, quite special. For: Creating, organising and sharing sessions and tactics. Details: Endorsed and used by national and international coaches, SportSessionPlanner.com is a comprehensive digital coaching platform, including creating, saving and sharing a session, adding videos, storing in an online library, preparing for match day and analysing matches, again with the ability to add video content in addition to statistics and notes. Available via a subscription model, as well as individual memberships (as priced above), clubs can purchase full packages for use by their full team of coaches. 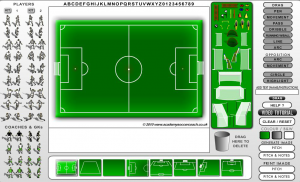 Details: Tactics Manager is a digital coaching package from the SoccerTutor.com website, a comprehensive platform which also includes eBooks, accessories and equipment. The software allows the coach to create practices and tactics, customise the players and equipment, store in an organised file and folder system, and save to PDF or image files. A free five day trial is also available to try out the software before committing to the full, one off fee, and there are also upgrades available for additional team licences, sharing your practices and a team management programme which includes more than 500 coaching drills. A version for iPad and Tablets is also in the pipeline. 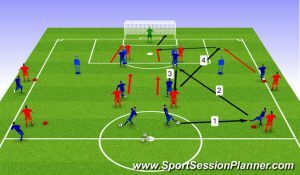 Details: For building attractive and professional looking diagrams and plans to illustrate coaching sessions, the Session Template by Academy Soccer Coach is a popular choice at both grass roots and professional levels. Available for an annual subscription, coaches can also upgrade to the ASC mobile option which gives use on tablets and mobiles for an additional £20.00/$35.00 a year, and can gain access to training sessions and video resources for £25.00/$45.00 per year. And if you belong to a club that wants its own bespoke design, a white label option is also available. As you can see from these examples, a wide range of choices. Let us know by commenting below or via social media, which digital software you use in your coaching.